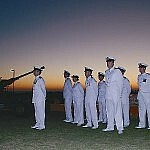 ANZAC Day holds a special place on the Rottnest Island calendar of events. The Island has a long and proud tradition of military service and on ANZAC Day we commemorate the men and women, both past and present, who have served their country in this moving dawn service. Presided over by Australian Navy Officers, the ceremony starts at 6.00am on the foreshore as the sun rises over the beautiful waters of Thomson Bay to the lament of the bagpipe. The service will be followed by a Gunfire Breakfast proudly cooked by volunteers. Travel on our 4:45am ferry to arrive in time for a special ANZAC Day service and Gunfire Breakfast. Afterwards, either travel back at 8:30am, or enjoy free activities before travelling on the ferry back to Hillarys at 12:00pm. * Price includes Island Admission Fee. Current and Ex-Servicemen must show their ADF or pensioner ID in order to travel for free, and must still make a reservation. You will need to return on the 12:00pm departure from Rottnest if you choose to add this tour option. There will be three or more separate tour groups, so please ensure you book friends/ family altogether if you wish to be in the same tour group.